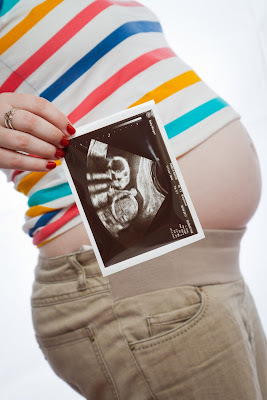 25 weeks pregnant with Anabelle and modelling 'her' blanket. Are any other rainbow mums obsessed with rainbow baby clothes and things? I am. Throughout his life I've been drawn to rainbow clothes to put on him. Tonight I've bought him these rainbow sleepsuits, at Christmas I bought him these rainbow pyjamas. Most of the time it is like I can't help myself, if I see something meaningful and beautiful, he has to have it! I've always loved rainbow colours before it had the meaning it does now. 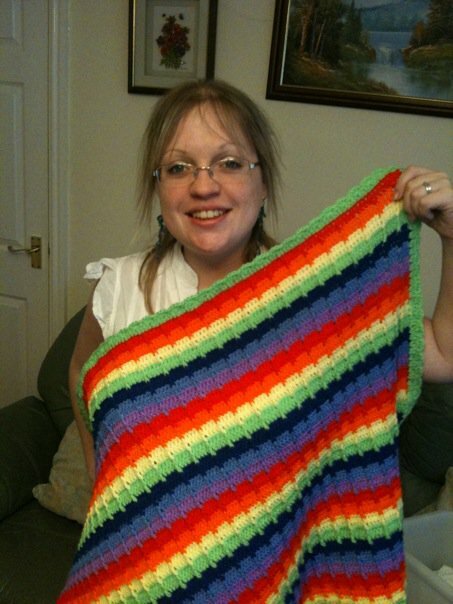 When we were expecting Anabelle I asked Mum to make her a rainbow blanket for the pram; quite ironic now really I suppose. The blanket obviously became Xander's and represents everything that he is. 17+5 weeks pregnant, we're having a boy! When I was pregnant with Xander I was instantly attracted to maternity clothes with a bit of rainbow in them; one top in particular that I wore the day we went to find out if he was a boy or girl. When we were planning his 'going home' outfit I knew he had to come home dressed in rainbow colours. I bought a set of long sleeve vests in Mothercare, especially because they had two rainbow stripe vests in the pack. I asked Mum to knit him a rainbow jumper. From the word go he has had to have something rainbow to wear. In every size since he's had multicoloured or rainbow clothes. I also love dressing him in bright colours, like a rainbow and they've always suited him, even when he was tiny! Even his birthday, even though Waybuloo themed had to have a splash of rainbow in there. How could it not when it was our rainbow baby turning one?! So his birthday cake was rainbow sponged, we did rainbow themed food. Even Christmas and choosing some of his presents; I wanted his play tent to be red, green, yellow and blue, a sort of rainbow coloured... any other colour combinations were not going to do and I searched for the one I wanted. The same with his playballs. Even down to buying reams of rainbow wrapping paper on his first Christmas that we've been using for him since. A bit of a freak? Maybe. I wonder if this connection with rainbow things will last forever. Or at least throughout his childhood? Maybe until he starts choosing things for himself? I can't see it stopping any time soon when I'm drawn to rainbow things for him! Beautiful boy, my rainbow baby. Wrapped in the rainbow blanket and visiting his sister for the first time. Parents use baby carriers mostly for practicality as it is cheaper than a buggy, quick and convenient to use and allows the parent to have hands free to do other things. However, research has show that it can also encourage a special closeness between mum and baby as it establishes close eye contact.